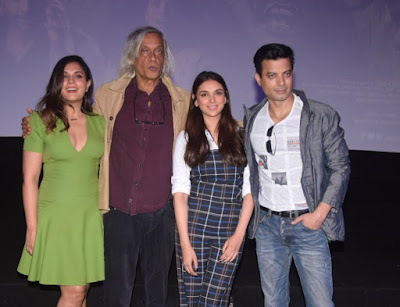 Veteran Filmmaker #SudhirMishra who is busy promoting his upcoming film #DaasDev has said that today’s actresses are professional who celebrates each other’s success. Sudhir Mishra interacted with media at launch of new cuisine and bar menu at Drinkery 51 restaurant on Wednesday in Mumbai. Recently, Kapil Sharma received criticism from people for hurling abuses on SpotboyE editor Vicky Lalwani via twitter and phone conversation blaming him for tarnishing his professional image, reacting to that incident, Mishra said, “Nobody should abuse anybody. Nobody should slap anybody and no one has the right to do anything. You can have disagreements with each other. No one has right to humiliate other person. There will be fights in pressure of work but we don’t have any right to insult each other." ‘Daas Dev’ is an amalgamation of Sharat Chandra Chattopadhyay's Devdas and Shakespeare's Hamlet. The story of a project as ambitious as Daas Dev, one which combines two classics of literature from different parts of the world, can get overwhelming for the audiences. Rooted in the world of politics and exploring the dynamics of lust, power and greed, Daas Dev gives a modern twist to the story of Devdas. Daas Dev is an upcoming romantic political thriller directed by Sudhir Mishra, starring Rahul Bhat as Dev Pratap Chauhan, Richa Chadda as Paro, Aditi Rao Hydari as Chandni, and Saurabh Shukla, Dalip Tahil, Anil George, Deepraj Rana, Saurabh Tyagi, Anurag Kashyap and Vineet Kumar Singh in pivotal role. The film is scheduled for release on 20 April 2018.